As I was getting a bit bored, with having mainly one type of spares to make only German figures. 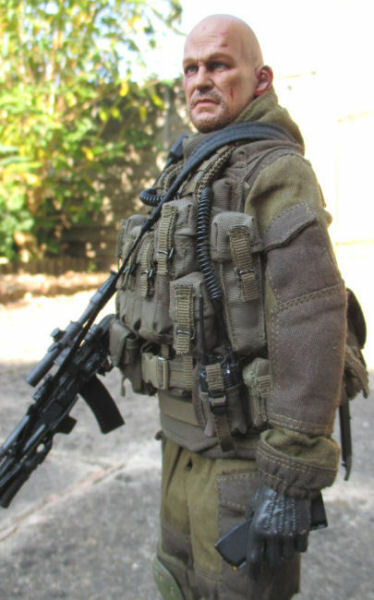 I decided to try an see if I could leave the hobby alone for a while, but I have slowly been dragged back to it after looking at the DAM and KGB Hobby modern Russian figures. As I wanted something to put together that is totally different from WW2 figures. Which also hopefully, does not involve building up a large store of spare parts, some of which may never get used. 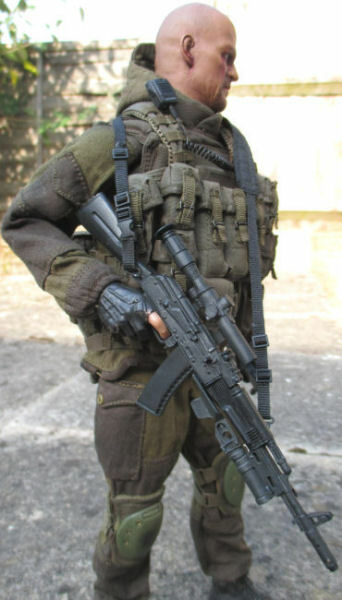 So this figure is based on the KGB Hobby 001-B boxed set, and on the OSW forum I found a review about the sets, along with some very nice figures based on the sets. The only problem with the sets are, that they do not come supplied with a body, hands or boots. So I have had to raid my spares boxes for these parts. 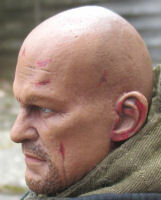 This is the HeadPlay headsculpt I used for this figure, Pictures 1. 2. & 3. are of the head as I bought it. Pictures 4. & 5. are after I gave it a pastel wash, which added some depth to it. The body I have used for this figure was a Normal shoulder body made by Very Hot, which I have found is a very good base for my model. I did a two page review of this body Body1 & Body2 along with some other types, to see how they all compare. 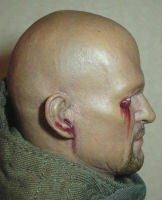 Plus what heads can be used with it, so it can give me a bit of variety as to what body parts I can use. 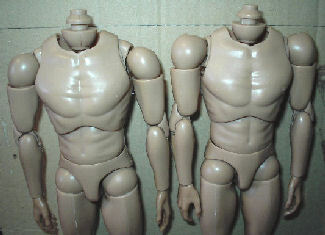 In the picture on the right, it shows the Narrow shoulder body (B001) on the left, with the other Normal shoulder body (B002) on the right. I did get confused at one point as to what body was which, and it was not until I looked at the picture on the right. Did I realise that the only difference in the two bodies is the ball joint at the shoulder. Otherwise both bodies use the same common parts and joints to make them. Note: Because I have done so many trials of various head types on the Very Hot bodies, I am not sure if the adapter it came with, is the one I am now using to fit the head onto the body. 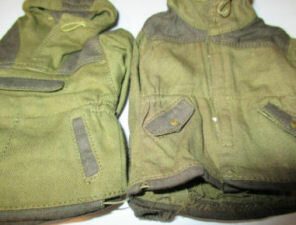 Picture 6. shows a pair of the KGB Hobby Gorka jackets, the one on the left is a new one. The one on the right has been washed and I then gave it a wash of some Brown pastel chalk, I have made another page to show how I did this on this page. The result is that the jacket has a darker and dirtier look to it, plus it has lost the new look of the one on the left. 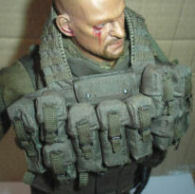 Picture 7. is of the 6B5 body Armor from the two box sets I have, the one on the left is a new one. With the one on the right, after I have given it a wash of some Brown pastel chalk to change the colour. 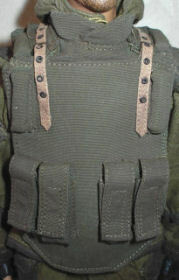 The pictures above show how I have fitted the 6B5 body Armor onto the figure, Picture 8. shows how the front flap has been lifted up to show the velcro pad. 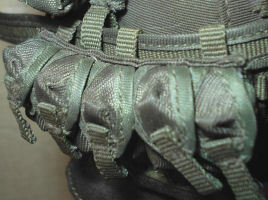 Picture 9. shows the side straps wrapped around the figure, so the velcro pads stick together. 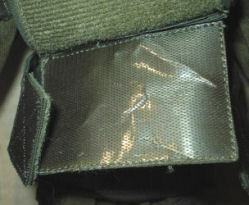 Picture 10. shows the front flap brought back down, and then fastened to the main velcro pad. 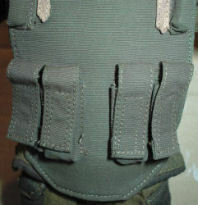 Picture 11. shows the front of the body armor tightened around the body, with the top straps held in place with some double sided tape on the under side. The pictures on the right show the panel on the back of the body armor, to help stiffen up the panel. I have put a thin square of balsa wood inside it. The next picture shows the panel closed up. As the set did not come with any boots, I decided to use a spare pair made by Soldier Story that I had in my spares boxes. 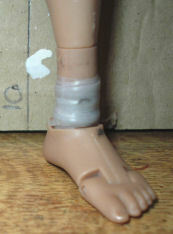 When I trial fitted the boots, I found the ankle joints were quite weak, so I have had to wrap them as in Picture 12 I also did the same to the knees. Picture 13. is a pair of new boots and as usual, to lose the new look that they have I firstly repainted them with some Black artists acrylic paint. When that had dried in Picture 14. 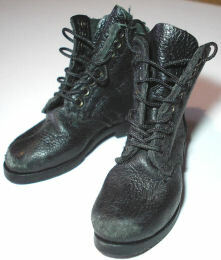 I then folded up the boots to add some creases to them, as well as adding some scuff marks with sandpaper to the toe caps. 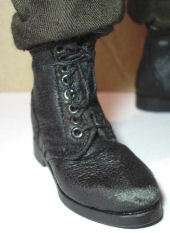 I then gave the boots a drybrush in Picture 15. of some Tamiya Light Sand weathering powders, to add some highlights to the edges of the boots and laces. 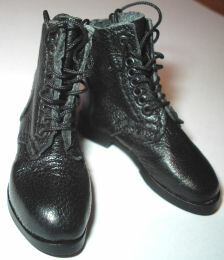 It also shows how the boots are on the figure, along with how I have bloused the trouser bottoms into the tops of the boots. The picture on the right shows the DAM knee pads that I bought loose to add my figure, these again have had the same pastel treatment as the other items I have used. 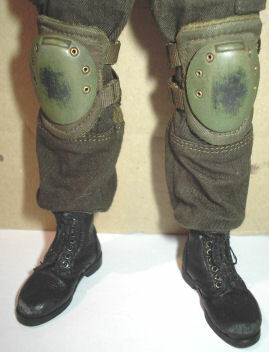 I have also used some sandpaper to add wear marks on the centres of the knee pads. With the equipment for this figure I have gathered together a mixture of both DAM and KGB Hobby pieces for this kitbash. 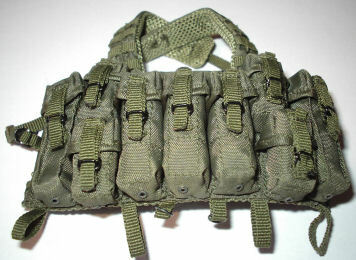 Picture 16. is the DAM lazutchik chest rig, which I bought loose as it came with the belt loops on it and a belt. 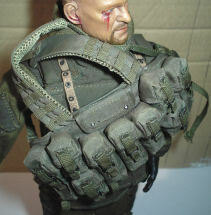 So that I could use the items from KGB Hobby such as in Picture 17. on the belt as well. Note: The KGB set 001-B does not come with a belt, so this was my reason for using the DAM chest rig instead. I have also made another page - Modern Alterations. To show how I have given them a wash of the Brown pastel chalks, to both make them look old and also dirty. So that the whole figure looks like well worn, and it is far removed from the new look everything had originally. 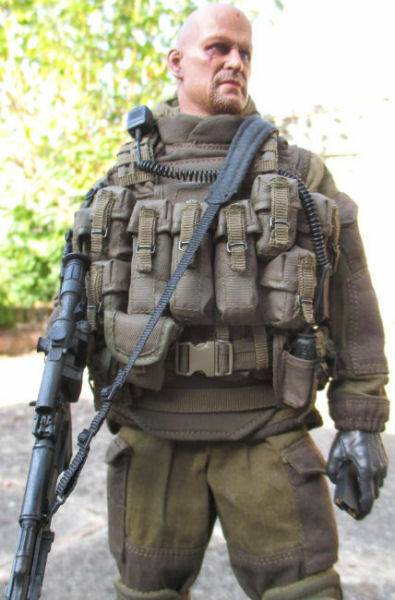 With this kitbash I have had to do a lot of thinking about how the equipment goes together on the figure, Picture 19. shows the figure with the armor vest on top of the Gorka suit. 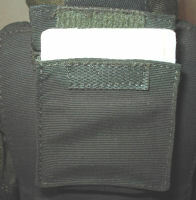 Picture 20. shows the chest rig that has been fitted over the top of it. 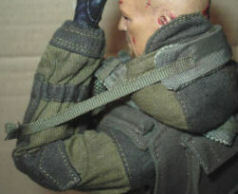 Note: Fitting the chest rig takes a bit of time, as I have to adjust the plastic buckles as far as they can go. Without having to adjust the metal clips, as I have found that they can be weak and break if handled roughly. 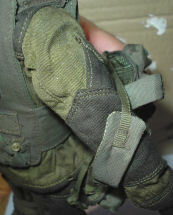 These pictures show the steps I took to get the chest rig on the figure, Pictures 18. & 19. has the outside one of the pair of 'X' straps pulled up over one of the arms. 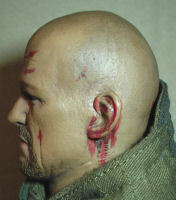 Note: It may be easier to remove the head if possible at this point, and refit it again afterwards. 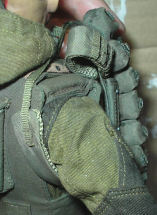 So that in Picture 20. the inside strap is against the neck, this then has to be pulled up and over the head, to end up as shown in Picture 21. 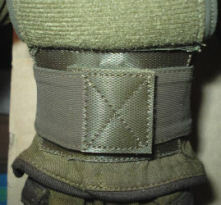 Then in Picture 22. the thinner part of the strap has to be gently stretched to allow the arm to be pushed up to allow the strap to go under the arm. Pictures 23. 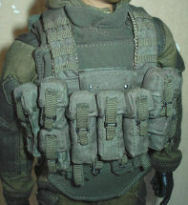 &24. show the front of the chest rig in place, which then has to adjusted so that it sits level on the front of the body. I also pulled the hood up, so that it sits over the top of the straps. 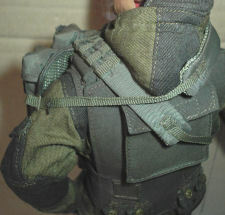 Picture 25. shows the left rear straps which I have adjusted to take up the slack, so that the chest rig tightens on the body. 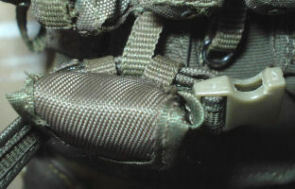 The picture on the right shows the right hand side straps, again the top one is tightened up. 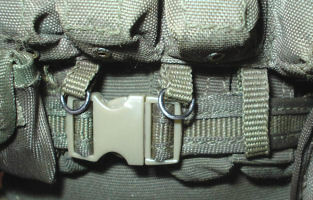 The bottom one is a long strap that comes across the back to buckle up, which again is adjusted to make the whole chest rig fit tightly. The picture below shows how I have worked out where the belt equipment pouches fit onto the belt. 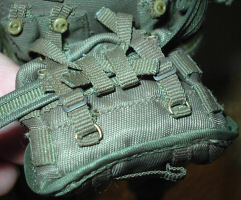 This has to be done by a combination of threading the loops on the back of the pouches, as well as fitting them through the support loops on the bottom of the chest rig as well. 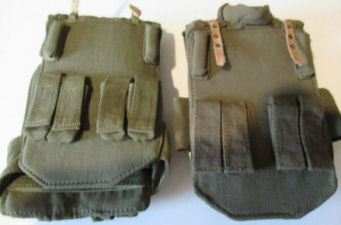 The parts are as follows from the left to right, DAM radio and pouch. KGB Hobby grenade pouch, DAM bayonet and scabbard, KGB Hobby backpack, KGB Hobby grenade pouch and a small KGB Hobby pouch. 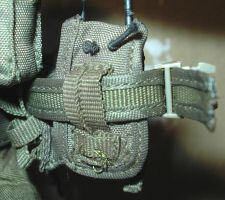 Assembly of the belt equipment is as follows, Picture 26. is the KGB Hobby small pouch with the belt passed through one of the pouch loops, the chest rig loop and through the other pouch loop. 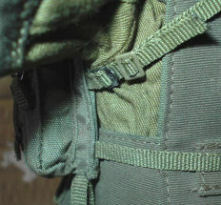 Picture 27. is one of the KGB Hobby grenade pouches, the belt is passed through pouch loop, the chest rig loop and then back through the other two pouch loops. 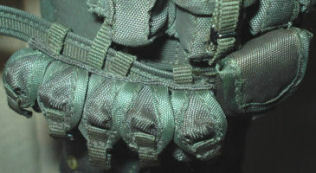 Picture 28. is the small pouch and grenade pouch assembled on the belt. 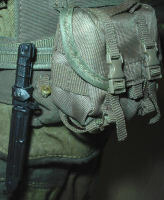 The next item to be fitted on the belt in Picture 29. is the KGB Hobby small backpack, Picture 30. shows the small backpack and then the DAM bayonet in place on the belt. 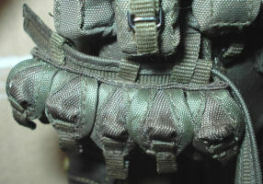 Picture 31. shows the other KGB Hobby grenade pouch, the belt goes through two of the pouch loops, the chest rig loop and then trough the other pouch loop. 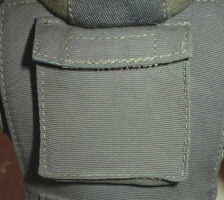 The belt in Picture 32. then goes through the loops on the DAM radio pouch, where I refitted the buckle. 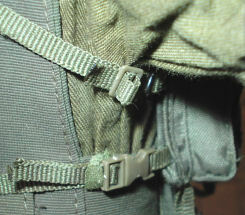 Picture 33. shows the belt passed through the final chest rig loop, where the belt has been clipped together after I have adjusted the belt to tighten it.